Wouldn’t it be great if there was a real Jem and the Holograms movie? Well, until they finally make one — we’re choosing to ignore the 2015 official movie — we’ve got Truly Outrageous, an outstanding Jem fan film. It was clearly made by people who not only liked but understood the original series, and it’s a must-watch for any Jem fan. Though Truly Outrageous is (mostly) live-action, it stays incredibly true to the original series. Sure, there are a few tweaks — in this version, Jerrica’s father dies in a plane crash while her mother dies of cancer, even though it’s the other way around in the original series — but this Jem fan film nails the right tone, look, feel and, above all, sound. That’s right, it wouldn’t be Jem without music, and even though these fans didn’t have the rights to any of the songs from the show, the original songs they present sound like they’d fit in. Jem’s singing voice, April Effie, does such a good job recreating Britta Phillips’ original sound, I actually wondered if they’d gotten Phillips herself. In fact, just about everything in this Jem fan film is perfect. The costumes and makeup are dead-on, and the actors really inhabit the characters. No one seems out of character, and we also get a number of fan-favorite characters like Video, Techrat and the Starlight Girls. There are even references to the outstanding Jem comics from IDW, and some deep cuts, like a cameo from the Limp Lizards. Truly Outrageous was created by Chickbait. It stars Chloe Dykstra as Jem, and was written and directed by Charley Feldman (who also plays Video). A few years back, Chickbait made another Jem fan film with most of the same cast. “Jem Reacts” was a comedy sketch in which the Holograms watch the trailer for that 2015 movie we said we’re ignoring. 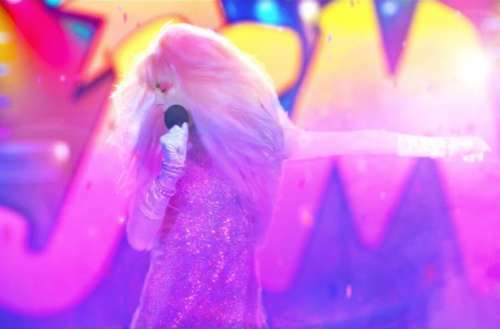 Though Truly Outrageous ends on a cliffhanger, we’ve been promised a sequel, and we can’t wait to see the next Jem fan film. Here’s hoping it comes out soon. What did you think of Truly Outrageous? Are you ready for the next Jem fan film?